Citation Information: J Clin Invest. 2005;115(7):1734-1742. https://doi.org/10.1172/JCI24397. In the developing growth plate, periarticular chondrocytes proliferate, differentiate into columnar chondrocytes, and then further differentiate into postmitotic hypertrophic chondrocytes. Parathyroid hormone–related (PTH-related) protein (PTHrP), regulated by Indian hedgehog (Ihh), prevents premature hypertrophic differentiation, thereby maintaining the length of columns. Ihh regulates cartilage development through PTHrP-independent pathways as well. Here we show that Ihh stimulates differentiation of periarticular to columnar chondrocytes (periarticular chondrocyte differentiation) and thereby regulates the length of columns independently of PTHrP. Mosaic ablation of the PTH/PTHrP receptor in the growth plate caused upregulation of Ihh action, PTHrP upregulation, acceleration of periarticular chondrocyte differentiation, and elongation of the columnar region. Decreasing Ihh action in these mice reduced elongation of columns, whereas decreasing PTHrP showed only a modest effect on column length. Overexpression of Ihh caused PTHrP upregulation, elongation of columns, and acceleration of periarticular chondrocyte differentiation. PTHrP heterozygosity in this model had a minimal effect on the elongation of columns. 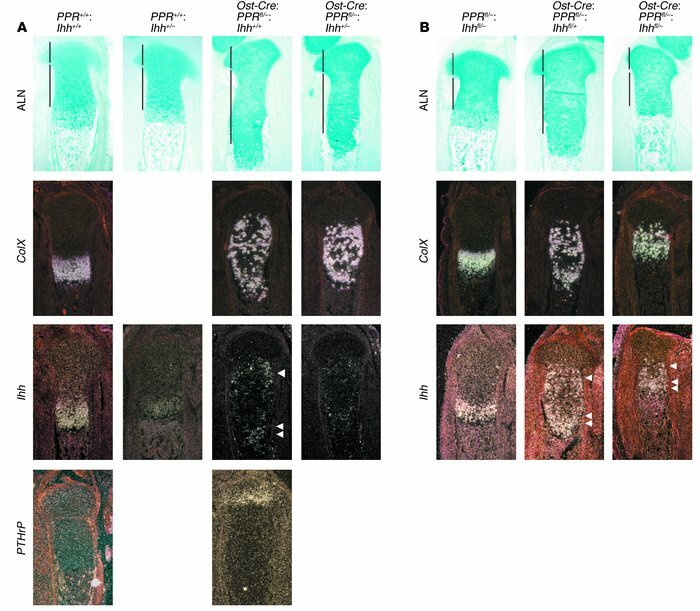 Moreover, the elongation of columns and stimulation of periarticular chondrocyte differentiation in these models were still observed when PTHrP signaling was maintained so that it remained constant. These results demonstrate that Ihh acts on periarticular chondrocytes to stimulate their differentiation, thereby regulating the columnar cell mass independently of PTHrP. Effect of Ihh reduction in mice with conditional mosaic ablation of the PPR. (A) The growth plate expansion in conditional PPR-mosaic mice (Ost-Cre:PPRfl/–) was partially reduced by Ihh heterozygosity. Ectopic hypertrophic differentiation due to loss of the functional PPR is shown by ectopic expression of the ColX mRNA (ColX; Col10a; MGI) and Ihh. Ihh heterozygosity reduced the Ihh expression level in both ectopic (arrowhead) and eutopic (double arrowhead) hypertrophic chondrocytes. The length of the growth plate (distance between the articular end and the interface between cartilage and bone marrow) was significantly different between Ost-Cre:PPRfl/–:Ihh+/+ and Ost-Cre:PPRfl/–:Ihh+/– mice (100% ± 0.78% Ihh+/+ versus 93% ± 1.38% Ihh+/– ; littermates were compared, n = 3 each group; P < 0.05). There was also modest shortening of the growth plate in PPR+/+:Ihh+/– compared with PPR+/+:Ihh+/+ mice. Vertical lines represent the periarticular and columnar regions. ALN, Alcian blue staining. (B) Conditional double mosaic ablation of the PPR and Ihh genes. The PPR floxed gene and Ihh-floxed gene were combined with the Ost-Cre transgene. In both PPR single mosaic (Ost-Cre:PPRfl/–:Ihhfl/+) and PPR/Ihh–double-mosaic (Ost-Cre:PPRfl/-:Ihhfl/–) growth plates, ectopic hypertrophic differentiation indicated by ColX mRNA (ColX) expression occurred whereas the level of ectopic Ihh mRNA (arrowheads) was reduced compared with that of the eutopic Ihh mRNA expression (double arrowheads). This reduction in Ihh mRNA expression accompanied reduction of growth plate expansion.